Throughout the isolated chambers it also could be used for ice cream. 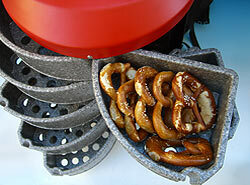 The Snack-Man was developed for mobile vending of food stuff. In combination with the Vario2 a team of two persons could offer a complete breakfast – a hot coffee and some bakery products. The first runner (Snack-Man) contacts the customer and does the financing part, the second one (Drink-Man Vario2) hands out the desired food and beverage. Naturally the Snack-Man comes with the Quick-Change-System and the X1 harness. So it can be combined with all other systems of the Drink-Man range.